The DPK4 duct probe unit have been developed to detect smoke in ventilation ducts. They offer significant benefits in terms of performance and installation. 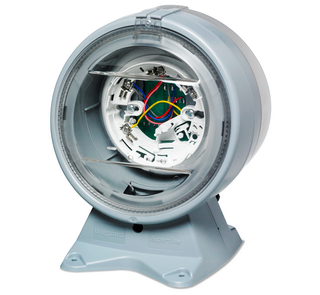 The system comprises a single duct probe tube andhousing specially designed for optimum airflow through the smoke detector and suitable for use in incoming, outgoing and circulation air ducts of ventilation and conditioning systems. The duct probes can operate across a wide range of airflow speeds and are especially recommended for installations in ducts with air flow velocities between 1 m/s and 20 m/s. Unlike more traditional duct probe units that employ an inlet and exhaust tube with sampling holes, the DPK4 and DPK4I units uses a highly efficient single sampling tube that is slotted along its length. This allows the sampling tubes to be cut to the desired length whilst maintaining maximum efficiency. The transparent cover gives clear visibility of the detector, its LED indication and airflow indicator. A red plastic flag is fixed inside the housing providing a simple but effective confirmation that there is no leakage and that the air flow from the air duct is in fact passing through the housing. In order to reduce the time required to test the duct probe detector during routine maintenance, an aperture is provided that allows aerosol test gas to be directed at the detector without having to dismantle the unit.